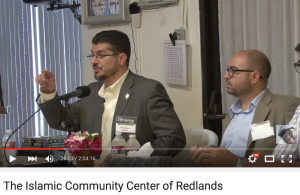 From the beginning of the attack on Wednesday in San Bernadino (CA) UTT called it jihad. The modus operandi was very similar to Paris in several ways (gear, vehicle, calm demeanor of the assailants, well-planned attack, and Muslim perpetrators). We knew from early on in the day the perpetrators were Muslim because many hours after two of the suspects were shot dead, no one in the media would tell us the most basic details about them except their gender. Major clue #1. Fox news analysis included the likely option that “mental illness” was the cause. The LA Times blamed the “incident” on a dispute between the “shooters” and others at the Christmas party at the Inland Regional Center where the shootings took place. Other media outlets simply called it “workplace violence.” All day long viewers were subject to analysts, newscasters, and guests who were free of any clue of what was happening before their very eyes. The blathering incoherence was stunning. The FBI gave us no deeper insight into the attack eight hours after it began. How long does it take to look at the jihadi and tell he is a jihadi? Since the FBI has zero training for agents about what Sharia adherent Muslim jihadis look like, maybe it was simple ignorance. Maybe the allah u akbar was not enough of a clue. 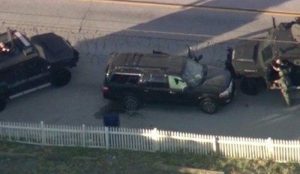 The jihadis identified by 1:30 AM EST Thursday are Syed Rizwan Farook (killed by police), his brother, whose true name is still not confirmed, and Tashfeen Malik, a female who was killed by police in the vehicle along with Farook. In advance of the substantive press conference by authorities, Fox News gave Hamas (doing business as the Council on American Islamic Relations or CAIR) the opportunity to set their narrative before facts could get in the way. 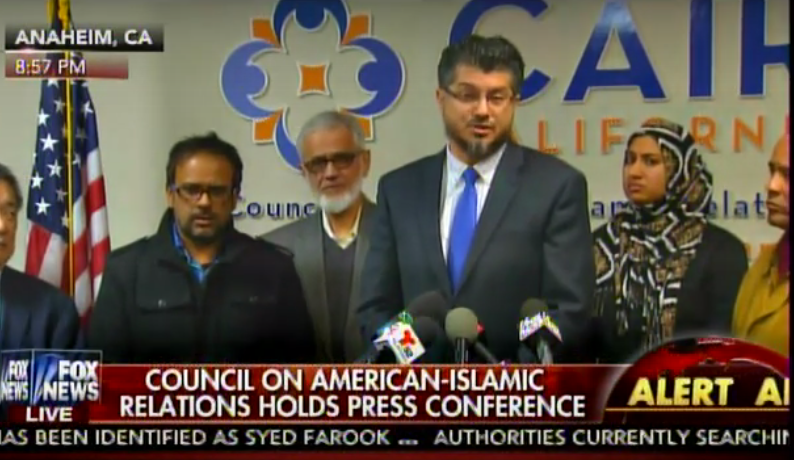 At their press conference, Hamas (CAIR) made the family of the jihadis out to be the victims, and told us we really cannot know the motive of the attackers. Maybe it really was mental illness. Fox News – once again – allowed the jihadis to promote their agenda on national television. Between the O’Reilly show providing Hamas years of airtime to execute their propaganda operation, and Fox News in general supporting Hamas terrorists from CAIR, the enemy does not need to do much social media highlight its efforts. That is being done for them by Fox. 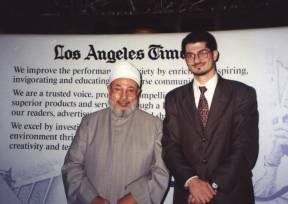 Present at the CAIR press conference was California Hamas (CAIR, Los Angeles) leader Hussam Ayloush with one of the most senior Muslim Brotherhood leaders in North America – Muzammil Siddiqi – standing behind him. Next to Siddiqi was Farhan Khan who is married to Farook’s sister Tatiana. While Khan and Farook’s social media pages make it clear the two were close, Khan claimed he was “shocked” Syed would ever do such a thing as kill people. Same old lies every time. Khan is also a jihadi and had advance knowledge of this event. Bet the bank on that. 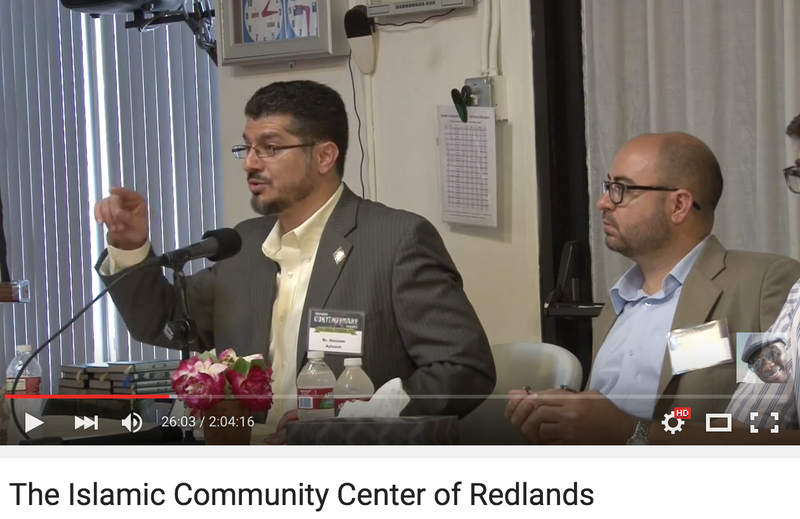 Hamas leader Hussam Ayloush speaking at the Muslim Brotherhood’s Islamic Community Center of Redlands, located a short distance from the jihadi attack in San Bernadino. For several years, UTT has written, briefed, and consulted with leaders about the threat of the Global Islamic Movement’s network in the United States. Specifically, UTT has made it clear that as each day passes without aggressive action taken by U.S. law enforcement to destroy the jihadi network in the United States, we reduce the number of options we have to deal with this threat. Five years ago, we had a wide variety of options and strategies to dismantle the Muslim Brotherhood’s Movement here. As time rolls on, we are backed into a corner and leave ourselves facing the reality that only significant force will extricate this cancer from American society. And a grave cancer it is. The first steps which must be taken, after a factual nature of the threat is shared with the American people, must be: to declare the MB a Foreign Terrorist Organization (FTO); arrest the top 150-200 of the MB leaders; shut down their key 2000 organizations here; seize their assets; and charge government leaders who are aiding and abetting them with appropriate violations of federal code, including treason. It would be appropriate to start with the President of the United States and his previous Attorney General. Since they were the next target of investigation after the prosecution of the Holy Land Foundation in 2008, lets first prosecute CAIR and all of its leaders nationwide, because, after all, they are terrorists. Hamas is a designated Foreign Terrorist Organization after all. Republican Presidential candidates responded by asking for prayers for the victims of this attack. President Obama and Hillary Clinton responded to the attack in San Bernadino by calling for more gun control. Been watching the various news conferences by San Bernardino Police Dept. and also one by the local Council on American Islamic Relations (CAIR) where they were quick to say this has nothing to do with Islam. While the police and FBI are trying to figure out a motive for the shooting, it would be interesting to know more details about the “Holiday/Christmas Celebration” that was being held at the facility where the shooting took place. Syed Farook, identified as one of the shooters, is described as being very religious (in the Islamic faith) and reportedly was an employee of the health care facility where the shooting took place. One possible motive could be that Farook took exception with the Holiday celebration if it had any display or reference to celebrating Jesus’ birth as being the Son of God. Any Christmas-related celebration is deemed an abomination in the Islamic ideology and would have been enough of a reason for Farook and any like-minded accomplices to feel justified in carrying out the attack and believe they were doing the right thing for their ideological belief/faith. You have nailed it once again, John. Hang on, if Cruz gets elected the calvary will be on the way and “homeland security” will finally listen to you. God bless you for your work. John, attended civilian class in Sep @ Centennial Gun Club Denver. I have been on board since. Have been sending emails to my list to make others aware what is going on. Have watched this jihad unfold before our eyes here and elsewhere. Heard all the ridiculous TV commentary re the CA shooting. I told everyone I knew exactly what this was. Understand you will be doing an advanced class in Denver in Aug. unfortunately only law enforcement. I mentioned to you in Sep we have a mosque being built in my town as I speak. I remember your response, “good luck”. I get it!!! That saves me. Thanks for being so sesenbli! Good reporting and analysis! You forgot to mention Zahra Billo standing the background of the Fox News CAIR press conference. Billoo is the Executive Director of CAIR San Francisco Chapter…she too is a real dangerous radical Muslima viper!! I’ve read your book. I recognized all the traits of jihad. Thank you for all you are doing. Bill Bennett commenting on his talk show this morning that, “if Farook’s father was shocked that his 28 year-old son did this (implying that was 28 years worth of vetting), then how can we think that two years of vetting will work with refugees?” Can you say Taqiyya? Bill assumed Farook’s dad was telling the truth. Thanks for all the hard work and effort you put in to the cause. Nothing like a little Jihad to stimulate the middle of your week. I’m waiting for Loretta Lynch to call this ‘workplace violence’. I totally agree that our President and the Democratic party will call this incident in California anything but what it is- a Terrorist attack. Of course Hillary Clinton gets on the band wagon to say we need more gun control. I think it is time to get out there and let our voices be heard that this is an attack on the American people. I’m tired of the same old rhetoric from Obama, a do nothing President. The same cover-up continues to plague our country, why can’t we do something to expose more of what is going on here. This CAIR organization should be exposed and taken out of this country. Let’s see some leadership here, tell the American people the truth! My father, a very tolerant man and no knee jerk anti-Muslim, described his media experience in the aftermath of the San Bernardino attacks. A prominent national news organization referred to multiple mass killings which have occurred over the past years. In EVERY SINGLE INCIDENT, the newscaster refused/neglected to mention anything about the religion or race of the shooters, except when they mentioned the Charleston shooting, when suddenly the newscaster decided to report that a “white” shooter had murdered innocent Christian black people in a church. Of course, this fact is true. But then why not mention race and religion of victims and perpetrators in other cases where religion or race may be a factor in the motivation of the killer and his/her choice of victims? Nope, only white or Christian perpetrators be described in detail. As usual, CAIR and other Muslim advocacy groups shed alligator tears as a backdrop to their real agenda of generating sympathy for Muslims, even as members of dozens of families will suffer though a Christmas of murdered or critically injured loved ones. As a soldier in Army Intelligence, I have, against my own colleagues, often defended against those who wish to paint all Muslims as terrorist sympathizers. I have also served in missions (Bosnia/Kosovo) where the US actively protected Muslims against barbaric, so-called Orthodox Christians (I am also Orthodox). However, the luke warm CAIR press conference, with a brother in law who was close to the shooter refusing to answer basic questions about the shooter and, in usual Muslim-American fashion, trying to paint his family as victims, to boot, is farcical, if not enraging. My hat goes off to every decent Muslim-American who has a pure heart and respect for his fellow American citizens, including non-Muslims, and who are willing and committed to report suspicious or confirmed Muslim extremist behavior among their friends, families or neighbors. There are confirmed cased of courageous American-Muslims doing this, God bless you. Virtually ALL Christians would report on other Christians, even family members, who they though might murder innocent Muslims or people of other religions in the name of Christianity. Why are so many Muslims reluctant to do the right thing, but expect the protections afforded them by this largely Christian/Jewish nation? Islam, and Islam alone, is truly in a crisis, and at some point, even we who defend Muslims against anti-Muslim bigotry, will lose our patience with the silent Muslim masses, and shift gears on the issue of Islam. We’ve had enough, my Muslim countrymen. Don’t be surprised when those of us defending you, standing in the way of anti-Muslim zealotry, decide to quietly step aside, walk away, and be silent while the American Muslim world gets a taste of its own medicine. And, unfortunately, the decent Muslims may suffer, too. Then, we will cry out that the perpetrators were not really Christians. And after many murderous attacks on Muslims in the name of Christianity, we will cry foul whey you, the American-Muslim, insinuate that we should do more to stop these Christian extremists. We will ask for your sympathy for us as Christians , and remind you that not all Christians are terrorists, and that Christianity forbids the murder of innocent people…….all this while members of our (Mosques!) churches, members of our families, people whose hatred is known to us (but we say nothing to the FBI), murder your families. Maybe then, you will finally understand. This story has all of the details correct. I watched the terrorist speak on a real taken from Fox or AP on CNN. The Hamas leader started with mental illness , followed by disgruntled employee , then on to us ( viewers ) trying to imagine the pain of the families of these two ( ” individuals ” ) yes, they weren’t shooters or monsters, they were individuals ! Lol this whole CAIR group should be shut down. Along with ODUMBO and associates. God bless you, John, for your indefatigable efforts on behalf of all Americans. This is great information. It is relevant information. It is wonderful that you have another outlet on occasion with Breitbart. This dissemination of this type of information at best will get you probably on the “no-fly” list and at worst (if its not already in play) put on a hit list. I’ve been a LEO for over 22 years and over the past five have been tactically releasing the same/similar info to others around my circle of influence. For four years and three months, I was affectionately known as a conspiracy theorist. Now, I am known, trepidly, as the intel oracle. Keep up the good work John and seriously, brother, watch your six. Same thing happened with our leadership elites and communist infiltration at the highest levels. What’s with our best and brightest that they always gravitate to the enemy against their own electorate? If only this untarnished assessment would gain traction across the USA we might still have a chance; but PC has clouded judgment & left people open to gross deception. While prayer is being ridiculed, we, who know its value, must indeed pray for blinded eyes to be opened, for hearts to be changed, & for godly wisdom to reveal the strategy that MUST be taken, even at this late hour. God is neither puzzled nor impotent. What an interesting time to be alive. You’re exactly correct. It’s like invasion of the body snatchers. Pods!! !, and they’re everywhere!!! They ARE the government. The newspaper is wrong, of course; God WILL fix this. There will be blood. We need President Trump ASAP! He clearly can’t say what he knows, we literally can’t handle the truth. It’s inconceivable to the average American, but the great thing about America, half of us are above average, and half of those are WAY above average, and a few of those are needed right now, and so we pray. Lord Have Mercy. Amen. Completely concur on all counts, John (especially prosecuting Obama, Holder & I would include Loretta Lynch), and I would add that, if it were possible, the criminal media should also be indicted for its total dereliction to tell the truth to the American people, potentially putting their audiences at risk for the lies, slander and gross negligence they perpetuate (both directly & indirectly). The American Criminal Liberties Union and its leaders should also be arrested for treason as well aiding & abetting the terrorists. Islam is Islam; there is no difference between the radicals and so-called “moderates”; the Koran says what it says; the only difference is the naive, illiterate ones don’t know their book and the literate ones who don’t carry out their evils are not true Muslims since they aren’t obeying the jihadist acts that the book tells them to initiate and carry out. Thanks for putting together this site and engaging all of us. Thanks John and team for the great education. Thank you for your patriotic work to uncover terrorists in the U.S. – I support your good work! OPINION – In case you missed Savage’s “Wahlid Shoebat” interview on 04.12.15 (begins at 53min. into the show and runs for thirty-one more), the ominous [and previously esoteric] nature of what was revealed regarding ISIS’ tactics – notwithstanding the obvious value of what your accrual of relevant data has already provided – may come as a surprise even to you. John, I have your booklet, “Raising a Jihadi” and attended one of your classes in Colorado. Have you tried to approach the O’Reilly Factor to get yourself on the show to “enlighten” them? It seems that everybody I talk to about this seems totally in the dark. So maybe Fox News is in place the same. I would hope they would examine your book and give it some air time. Treason. Exactly. I hope Ted Cruz gets you on his team. Yes, from early on, I could sense that the Bernadino incident was being treated in an errie way. It is now unraveling but how can we get the general public to smell out these situations before others? Unfortunately, there will be other incidents. Come on public, learn the true nature of Islam: the Quran is NOT scripture; it is a recipe for killing innocents.